An imagineer quote: "The magic is as wide as a smile and as narrow as a wink, loud as laughter and quiet as a tear, tall as a tale and deep as emotion. So strong, it can lift the spirit. So gentle, it can touch the heart. It is the magic that begins the happily ever after." Disney Goddess sure is a big deal! It's official now! Featured Disney writer in Alltop! To me, and so many Disney fans, the Walt Disney World Resort is like a little piece of heaven on earth. All in good fun, here is a list of “shalls” and “shall nots” when visiting this secular paradise. Thou shall not have any vacations before Disney. Thou shall not consume a Prime Time peanut butter and jelly milkshake and immediately ride Rockin’ Roller Coaster. Thou shall give up a seat on the bus for the elderly, disabled, or a person holding a baby. Thou shall not be Grumpy at any point- unless your hat or shirt warns everyone around that you are. Thou shall not hold a spot in line until the end and then call up the twenty friends who have been playing in the park while everyone else waits. Thou shall stay in a Disney Resort. Thou shall honor the memory of Walt Disney by going into “One Man’s Dream” at least once in each trip. Thou shall have, at minimum, one popcorn, one Mickey Bar and a Dole Whip while on vacation. Thou shall walk slowly down Main St., appreciating the vision that occurred so many years ago. Thou shall cry while watching Wishes. Putting the Puzzle Together: The Steps in Planning the Best Disney Vacation! 15 Years of Gingerbread at the Grand Floridian! More great stuff I read! Guinness Cupcakes and Rainbow Fudge! I got a new attitude! Magic delivered right to your inbox! Grab my button! Just don't pinch! Friends of Disney Goddess! Yay! More Disney knowledge! Make sure to read "40 days to 40 Years!" 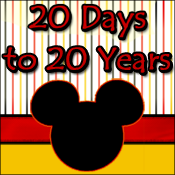 and "20 Days to 20 Years!" Great Disney's Fort Wilderness info and way too much kooky fun! Feel free to email me with Disney related questions!